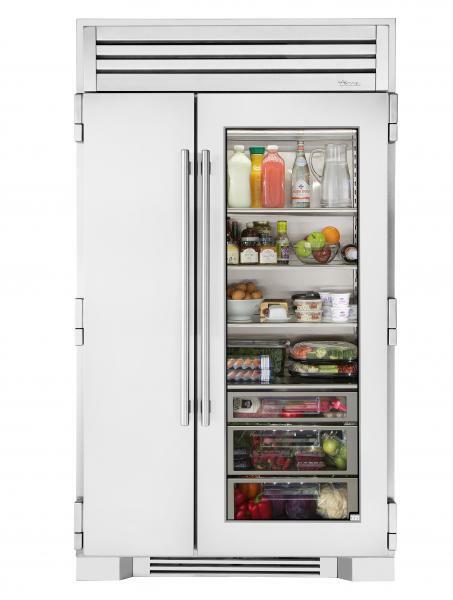 True Residential recently introduced a variety of new options and products to its offerings, including a new 48-inch full size refrigerator with a glass door. Debuted at the AD Design Show in New York, the stainless-steel fridge features 29.4 cubic feet of interior space, interior LED lights, and ergonomically designed tubular handles. As a division of True Manufacturing Co., which specializes in commercial refrigeration products, True Residential brings many of the brand’s heritage to its comnsumer products. As a result, the new unit features a commercial-like, lift-up grill on top of the unit with a toe kick similar to the brand’s undercounter units. True also made four additions to the Build Your True collection, which focuses on color and customization. New options include cobalt blue and matte white finishes, as well as gold and pewter hardware options. These join the existing finishes of stainless steel, copper, brass, and chrome. The manufacturer also showerd the industry’s first joining kit, which seamlessly unites multiple 30-inch columns for a sleek appearance. “The growing Build Your True collection and new Joining Kits give homeowners even more freedom to create kitchens that look the way they want and, most importantly, reflect the way they live,” says Steve Proctor, True’s director of sales and marketing.